Do you want Sunshine on a cloudy day? Let me be the ray of happiness that keeps you going all year long! 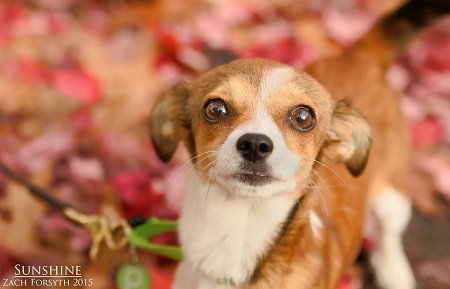 I’m a 1 year old female Chihuahua that is bursting with good cheer. I may only be 6 lbs, but with such a big presence you’ll always know when I’m in the room! That makes for a great personality trait, but it does make it hard during hide and seek (which I’m surprisingly bad at). I’m OK with that though because there are plenty of games I am super good at like who-can-eat-the-most-string-cheese and curl-up-in-the-smallest-ball-on-the-couch! Without a doubt I can be friends with anyone no matter the species and no matter the age. I know I’ll be a wonderful addition to your family, do you think so too? Fill out the adoption application so we can schedule a meet and greet! I am fixed, vaccinated, and microchipped. My adoption fee is $250.